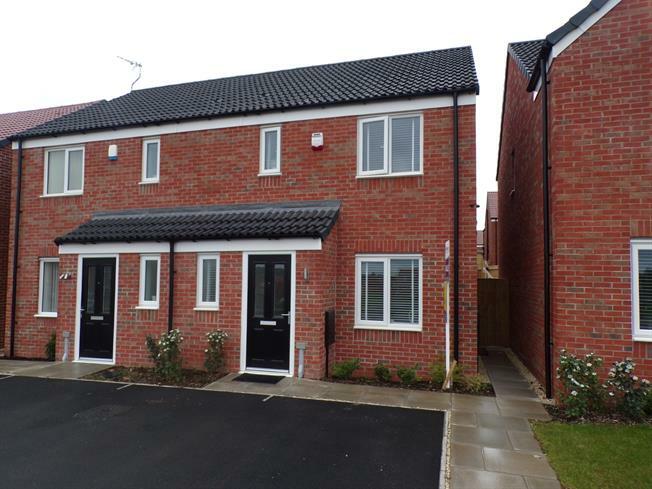 3 Bedroom Semi Detached House For Sale in Mansfield for Asking Price £149,950. Frank Innes are pleased to welcome to the market this well presented three bedroom semi detached family home that you can move straight into! In brief the property comprises of entrance hallway, downstairs WC, spacious lounge with under stairs storage which then leads through to the modern fitted kitchen diner with integral appliances and French doors opening out to the rear enclosed garden. To the first floor initially is the master double bedroom which has fitted wardrobes and en suite shower room, second double bedroom with fitted wardrobes, family bathroom with white three piece suite and third single bedroom. The property benefits from being double glazed throughout, gas central heated and having a driveway to the front of the property. UPVC French double glazed door, opening onto the patio. Double glazed uPVC window facing the rear overlooking the garden. Radiator, vinyl flooring, ceiling light. Roll top work surface, wall and base units, one and a half bowl sink, integrated, electric oven, integrated, gas hob, overhead extractor, integrated dishwasher, integrated. Double glazed uPVC window facing the front. Radiator, carpeted flooring, under stair storage, ceiling light. Double glazed uPVC window with obscure glass facing the front. Low level WC, pedestal sink. Double glazed uPVC window facing the front. Radiator, carpeted flooring, a built-in wardrobe and built-in storage cupboard, ceiling light. Double glazed uPVC window with obscure glass facing the front. Radiator, vinyl flooring, ceiling light. Low level WC, corner shower, pedestal sink. Double glazed uPVC window with obscure glass facing the side. Radiator, vinyl flooring, ceiling light. Low flush WC, panelled bath, pedestal sink, extractor fan.